Subway continues to be a top-performing franchise. If you want to purchase your own Subway franchise, there are a few things to know before you jump in. You'll be required to make an initial investment and meet their net worth and liquid cash requirements. These costs will vary depending on when and where you open your franchise. There's also an upfront franchise fee and royalty fees based on sales that you'll need to factor in. There are no company-owned Subway franchises. Most of the franchises are in the United States, but the company has locations in Australia, New Zealand, Saudi Arabia, the United Kingdom, Spain, Italy, France, Germany, Puerto Rico, Japan, Belgium, Luxembourg and the Netherlands. When people think of the words “franchise” or “fast food,” they almost always immediately envision McDonald’s, which was the gold standard for quick-serve restaurants. One of the major reasons for this instant association is that McDonald’s historically had the most restaurant locations worldwide, and therefore was the biggest and most prominent. But Subway has grown to rival McDonald's and its international expansion has made it a key player in the fast-casual dining arena. It is unlikely that founder Fred DeLuca imagined having so many submarine sandwich shops back in 1965 when he opened his first location. Fred DeLuca was born in Brooklyn, New York in 1947 and grew up in Bridgeport, Connecticut. To pay for his college education, he asked a family friend (Dr. Peter Buck, a nuclear scientist) for a $1,000 loan. Instead of loaning the money without conditions, Buck loaned the 17-year-old the $1,000 so that Fred could open a sandwich shop, which he named Pete’s Super Submarines. By 1974, the name had changed to Subway and the duo owned and operated 16 units throughout the state of Connecticut. Subway started franchising in 1974 with its first franchised unit in Wallingford, Connecticut. The concept continued to grow, and by 2013 Subway was reportedly opening over 50 new restaurants per week. Over history of the brand, Subway has seen its challenges. Most notably, its 15-year brand ambassador, Jared Fogle, was convicted on child molestation charges in 2015. Fogle claimed to have lost a significant amount of weight eating only Subway sandwiches, and was the company's public face and spokesman from 2000 to 2015. The company severed its ties with Fogle when the child molestation charges were filed, and despite the embarrassment, the company was not found responsible in any way for Fogle's criminal acts. Subway offers regular free seminars where those interested in becoming a franchisee can meet Subway representatives and is also a regular attendee at franchising trade shows and events. 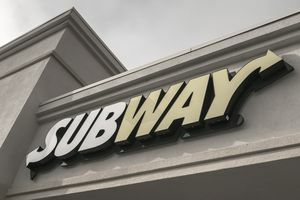 The Subway franchising website provides detailed information about how to apply to become a Subway franchisee and also lists existing franchises that are up for sale. The Subway training course is two weeks long and teaches business concepts, methods of operation, and basic management skills. The training time is spent in a classroom and on-site at a local Subway franchise for a "hands-on" experience. At the end of the two weeks, each potential franchisee must pass an exam to become a Subway franchisee. A total of 8 to 12 employees is required to run a Subway franchise. Support offered by Subway to its franchisees includes purchasing co-ops, grand opening support, a toll-free line, field support, meetings, newsletters, and the internet. Subway's marketing support to franchisees includes co-op advertising, regional media, national media and other ad options.